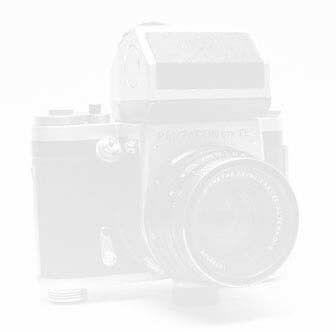 Before we look at KW’s Medium Format SLR, we need to see what developments from other manufacturers helped to inspire the design of KW’s medium format camera in what has sometimes been referred to as the “T”, as opposed to the “cube”, shape. Some writers refer to the shape of these cameras when viewed from above as being (very approximately!) similar to a capital letter “T” (upside-down and with a very short vertical line!). 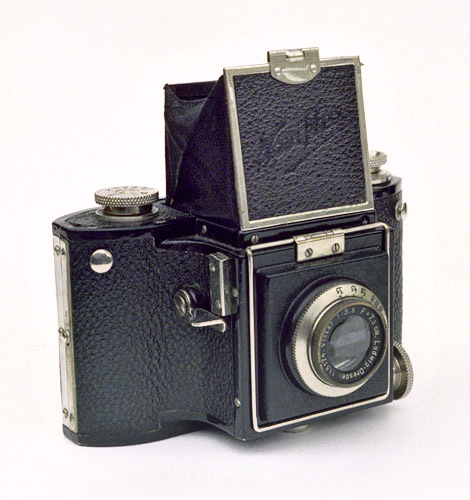 The “cube” design is epitomised by the Hasselblads and subsequent similar designs (from Bronica, Mamiya, Kiev Arsenal, etc). 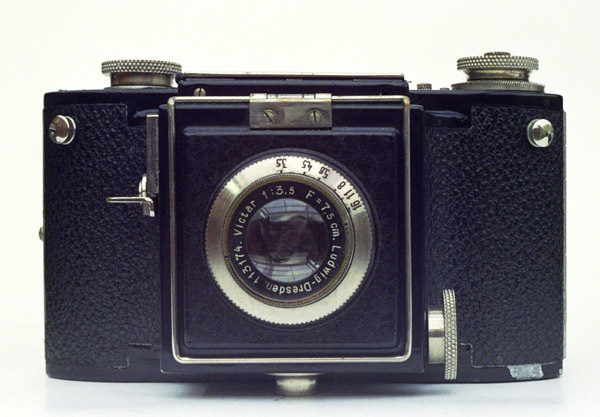 In 1935 the Noviflex Medium Format SLR was advertised, and I have handled and photographed two examples of this camera. The Noviflex was produced in Germany. Hummel states (p.95) that the Noviflex did not enter serial production, although there is evidence that it did. He clearly did not have access to the relevant pre-war production information and located as he was in communist East Germany, he is not likely to have had access to documents from “capitalist” countries such as West Germany (as it was at the time) and the UK. The Noviflex had a focal-plane shutter with speeds from 1/20 to 1/1000 sec (on the camera illustrated on the right the 1/20th marking is obscured by a mark on the shutter speed dial). This one is fitted with a f/3.5 7.5cm Victar lens from Ludwig in Dresden. Focussing on the Noviflex is unusual, since the lens is not in a helical mount; instead, it is focussed by a large knurled wheel on the side of the mirror housing. 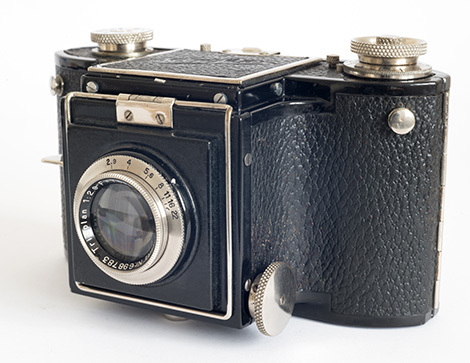 The Noviflex was also available with a Meyer Görlitz 7.5 cm f/2.9 Trioplan. 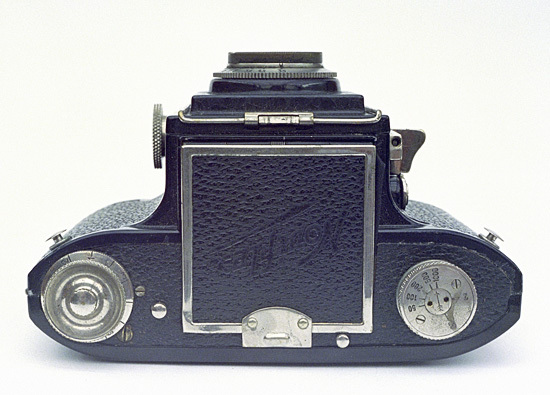 The Noviflex had a fixed waist-level finder, the front of which was made of metal, while the other three sides were cloth on a wire frame, as was then standard practice for viewfinders on many cameras. Film advance was via a knob at the left-hand end of the top plate. The Noviflex shown here with the Ludwig Victar lens weighed 1lb 15oz (c. 880 grs) and measured (W × D × H with finder closed and lens at infinity) 6" × 3 5/8" × 3 3/8" (152 × 92 × 87mm). The “T-shaped” design can be easily seen from above. Here the focussing wheel can be clearly seen. This Noviflex has the Meyer Trioplan lens. The Noviflex has the straight film path that was adopted by the Reflex Korelle and eventually by the Pentacon Six. This is the first version of the Noviflex. Note the direct-vision wire frame finder, which folds down neatly over the front of the camera. Two years later, the Noviflex II offered interchangeable lenses. A 150mm f/5.5 Meyer Tele-Megor was reportedly available. The 1970 SLR Yearbook quotes the price when originally sold in the thirties as ranging from £10 10s 0d with an f/3.5 lens to £16 10s 0d with an f/2.9 Trioplan (£10.50p to £16.50p to our younger readers!). 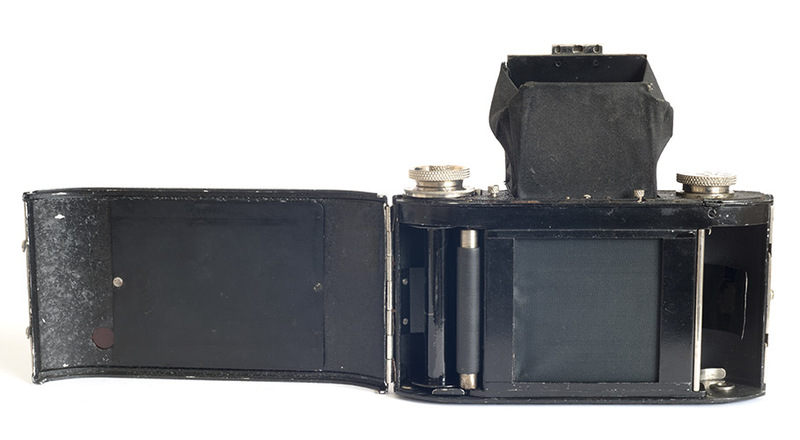 The Noviflex had a short life, but it played a part in the development of the camera which can be considered the grandfather of the Pentacon Six.